Both Adler and Kass graduated from Cleveland Heights High School in 1971 and 47 years later, they are both retiring after successful careers. In June, Zinner & Co. 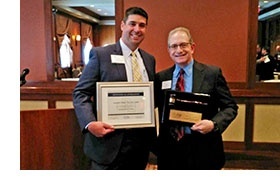 Partner Howard J. Kass, CPA, AEP®, CGMA, finished his one-year term as president of the Cleveland/Akron Chapter of the Society of Financial Service Professionals (CAFSP). A CAFSP member since 2010, Kass was thankful for the support he received from the organization’s officers and board members during his term.